Founder Anita Dolce Vita on cracking the queer "Dress Code" and more. 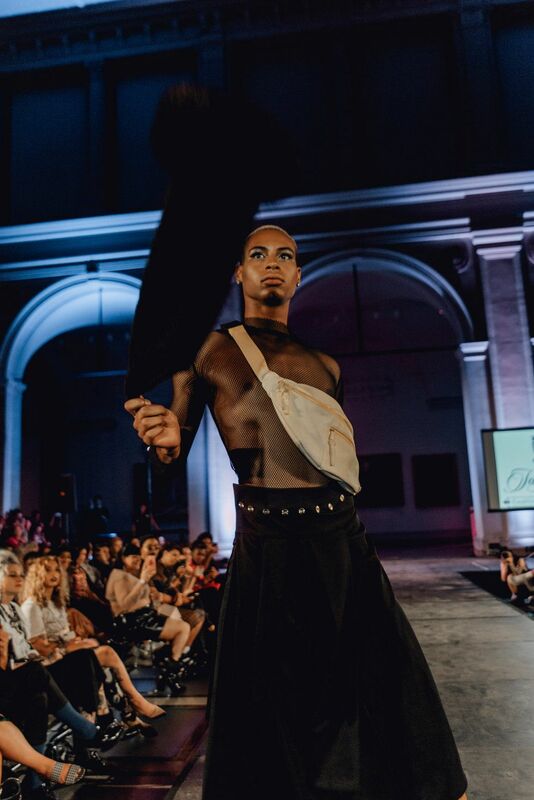 DapperQ, the digital content platform that had previously centered queer femmes, non-binary people, and transgender men (and continues to do so), had its fifth annual multi-designer fashion show in celebration of the community at NYFW. The show, which drew hundreds of attendees to the Brooklyn Museum, was more inclusive than ever. It featured designs from 10 queer brands including The Phluid Project, Kris Harring, AC Space, SALT, Stuzo Clothing and more; the event was also sponsored by Into, the digital content arm of Grindr. Riffing on the show's central theme "Dress Code," which inherently blows the boundaries of patriarchal, conformist dress codes wide open, PAPER noticed everything from SALT's interpretive masks to JAG & CO's tailored "gentlemen" suits, to Audio Helkuik's Scout couture. The show also featured a refreshingly diverse range of racial and ethnic identities, body ability (there were disabled models throughout who got thunderous rounds of applause), age (including several immaculately dressed children), and size (plus-size models in bathing suits). PAPER caught up with DapperQ's founder Anita Dolce Vita backstage, who works as a clinical nurse by day, and an inclusive mother to a queer fashion revolution nonstop. This is the fifth year of DapperQ. What would you say is the biggest change you've seen? This show means a lot to the queer community because it captures so many facets of what maybe we don't typically see during fashion week. I think on two different points, I think in the larger society, what the show has become, in response to a consistent appropriation of minority cultures as trends or fads or kind of presenting minority groups cultures through the lens of whiteness and heteronormativity. So, I think why this show really means to a lot of people is because we are the owners, the creators, the producers and we're bringing it to the runway; we are slaying it. We are owning our own narrative, designs, and bodies. The story is being told by us, we are the designers. That's what's so important, even our photographers and everything, it's through the lens of our own community. Also, another change that we've seen within the queer community is that people think that since we're all LGBTQ, we're all under this same umbrella, that we all have the same struggles, and we don't. We're only just beginning to have real conversations about layers of privilege and different forms of oppression. DapperQ started out originally celebrating masculine identities and there was a need for that and a void there — like if you were a masculine-presenting person that society said masculinity was off limits too, you couldn't really look at GQ or Vogue, there was no space for you. Then over the years, I saw the proliferation of masculinity being celebrated at the expense of femmes. But, we are here, too: I wanted to bring the power of femmes and femininity to the runway as well. "I think why this show really means to a lot of people is because we are the owners, the creators, the producers and we're bringing it to the runway; we are slaying it." From a design perspective are there things that you are seeing more and more now with the show? It's never been about one designer, it's always been about a mixture of designs from different communities. Our first show was six designers and four of them were suit companies, so now you see we have more designers, but we are showing clothing that is more across the spectrum and is feminine and masculine and everything in-between. Often, binaries are repeated within our own communities and what I am also seeing in design is that when we talk about gender neutral, it's not just gender neutral as the absence of femininity. So, what is gender neutral? It's like the same way we talk about race, "neutral" is always "white." It's the default. Gender neutral by default and because the mainstream population has also gotten ahold of it, is thought to be the absence of femininity, or even more masculine maybe. So, what I am seeing designers do, even their more masculine leaning designs, is incorporating things that were traditionally considered off-limits to masculinity. So, we're seeing suits with florals, ruffles, and bows and things like that — we're breaking away from the binary. What do you feel most excited about this year? I am most excited about seeing the designers grow over the years. I've seen some designers who have started off as T-shirt companies and have just kind of had a logo on a hat or sweats and and are now next-level. I think they are deserving of the same type of shine, and we just want to continue to keep pushing them forward and providing that platform. I am also excited to see the diversity of the models. This is our most diverse designer lineup as well. Who are some of the designers you've seen flourish? Stuzo. I've just seen them grow and grow. They bring it and are not stagnant at all. Also, Austin and Jessie's new project, SALT was great, and started as a type of streetwear, and now they are bringing in a new collaboration with these new headpieces that I can't wait to see on the runway. They're knit and have live flowers in them. I'm ready to see some avant-garde pieces, also too, because in the past I think people have played it pretty safe. I think our earlier audience was initially wanting to see things that they could purchase as ready-to-wear— and we definitely do have some ready-to-wear pieces but we also have some more couture — though, to be honest, everything is ready-to-wear. Can you tell me more about the show's theme, "Dress Code?" This year, we're looking at clothing as a language, and we're trying to challenge the audience to explore beyond what they would normally interpret and try to see things in a different way. I think some designers, like SALT, who had their models heads all covered — that was part of the theme and it is asking you to identify what you see. All the designers are pushing the boundaries from an art perspective. For instance, with JAG & CO, you'll see suits on all types of bodies. But what is your immediate reaction when you see someone wearing a suit, and you cannot identify in your mind how you want to categorize them? Even for myself, I've always just been like a J Crew, Kamala Harris type of gal, and when I say that I am queer, people sometimes say, "Oh, you don't look queer." But what does that really mean? We are sometimes policing each other and using the same normative binaries that straight people impose on our own community to define each other. I may seem like your ordinary business person, wearing my J Crew or whatever, but it's like I am queer and in the community, too. These are some of the larger questions I'm interested in. But also, no matter how you look at it, it's like you can't actually crack our code. That's a good thing.